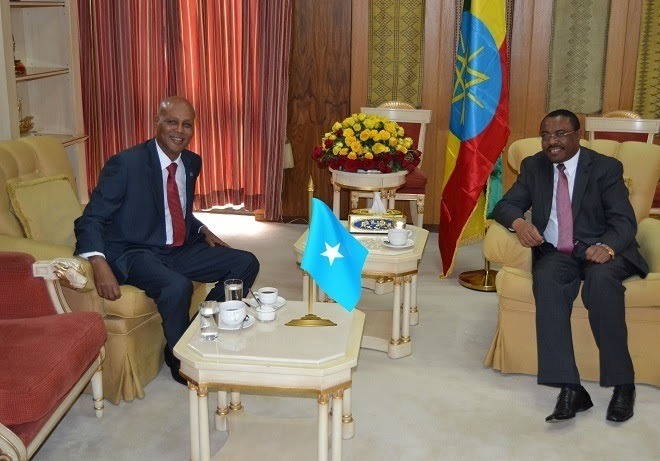 Addis Ababa (HAN) Jun 13, 2014 – Somali Prime Minister Abdiweli Sheikh Ahmed on Wednesday met with his Ethiopian counterpart Hailemariam Desalegn in Addis Ababa for talks following the conclusion of a special session of the Inter-Governmental Authority on Development (IGAD). The meeting focused on ways to strengthen bilateral relations between the two countries and possibilities for co-operation on improving peace and security in the region, according to a press release from Ahmed’s office. Abdiweli thanked Ethiopia for contributing troops to the African Union Mission in Somalia, and said they had discussed ways for Ethiopia to expand its efforts in helping to maintain peace and security in Somalia. 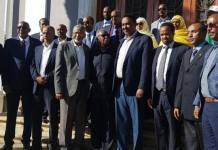 Desalegn said both Ethiopia and Somalia were united in wishing to see Somalia stable and ruled by law, offering the full support of his country’s armed forces in helping achieve this goal. Meanwhile: Prime Minister Abdiweli Sheikh Ahmed, who chaired the conference, discussed peace building, creating inclusive politics, access to justice, improving economic foundations, providing equitable services to citizens and strengthening revenue collection. He also spoke about the important role of women and youth in the future of Somalia. “Let us not forget our future generation, our youth. Ensuring access to primary and secondary education, sports programmes, and jobs for young people will propel Somalia to a stable future,” Ahmed said in a statement. Next articleFIFA World Cup: England VS Italy on Saturday,Fitness worry?